Another pet peeve: can’t kids just eat? Yes, I know getting kids to eat their veggies can be challenging. Cornell researchers wondered this is because kids like different ways of presenting foods than adults. They tested this idea in a study just published in Acta Pædiatrica. Contrary to the default assumption that parents and children share preferences for the ways in which food is presented on plates, we find that children have notably different preferences than adults. Most remarkably, we show that children tended to prefer seven different items and six different colours on their ideal plates, while adults tended to prefer three different colours and three different items….Given that adults often prepare plates of food for children to eat, these findings suggest new windows for encouraging diverse childhood nutrition. I suppose this is the rationale behind the latest approach to getting kids to eat better diets: My Fruity Faces. These are edible stickers that kids can stick on whatever fruits, vegetables and, presumably, any other food that happens to be handy. The stickers are less interactive and creative than the old Mr. Potato Head toy, but kids can eat them. And they ought to like eating them: Sugar is the first ingredient. Sugar is followed by Hydroxypropyl methylcellulose(Modified Cellulose), Water, Natural flavor, Modified corn starch, Glycerin, Polyglycerol esters of fatty acids, Citric acid, Red beet concentrate, Turmeric, Red cabbage extract, Caramel color, Sodium Bicarbonate. Will something like this reallyget kids to eat more fruits and vegetables? Cornell researchers: get to work. 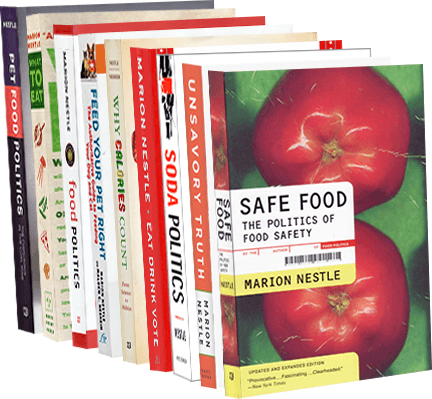 Q: What’s on the food politics agenda for 2012? Can we expect anything good to happen? A: By “good,” I assume you mean actions that make our food system safer and healthier for consumers, farmers, farm workers and the planet. Political leaders will avoid or postpone taking action on food issues that threaten corporate interests. Sometimes Congress acts in favor of public health, but 2012 is an election year. Expect calls for corporate freedom to take precedence over those for responsible regulations. Maybe next year. Something will happen on the farm bill, but what? Last fall’s secret draft bill included at least some support for producing and marketing fruits and vegetables, and only minimal cuts to SNAP (food stamps). Once that process failed, Congress must now adopt that draft, start over from scratch or postpone the whole mess until after the election. SNAP participation will increase, but so will pressure to cut benefits. With the economy depressed, wages low and unemployment high, demands on SNAP keep rising. In 2011, SNAP benefits cost $72 billion, by far the largest farm bill expenditure and a tempting target for budget cutters. While some advocates will be struggling to keep the program’s benefits intact, others will try to transform SNAP so it promotes purchases of more healthful foods. Both groups should expect strong opposition. Childhood obesity will be the flash point for fights about limits on food marketing. The Lancet recently summarized the state of the science on successful obesity interventions: taxes on unhealthy foods and beverages, restrictions on marketing such items, traffic-light front-of-package food labels, and programs to discourage consumption of sugar-sweetened drinks and television viewing. Expect the food industry to continue to get Congress to block such measures, as it did with U.S. Department of Agriculture school nutrition standards (hence: pizza counts as a vegetable). The Federal Trade Commission will postpone release of nutrition standards for marketing to children. Although Congress asked for such standards in the first place – and the standards are entirely voluntary – it just inserted a section in the appropriations bill requiring a cost-benefit analysis before the FTC can release them. Why does the food industry care about voluntary restrictions? Because they might work (see previous prediction). The Food and Drug Administration will delay issuing front-of-package labeling guidelines as long as it can. The FDA asked the Institute of Medicine for advice about such labels. The institute recommended labels listing only calories, saturated and trans fat, sodium and sugars – all nutrients to avoid. Although the institute did not mention traffic-light labels, it did recommend check marks or stars, which come close. The food industry much prefers its own method, Facts Up Front, which emphasizes “good-for-you” nutrients. It is already using this system. Will the FDA try to turn the institute recommendations into regulations? Maybe later. The FDA will (still) be playing catch-up on food safety. The FDA got through the 2011 appropriations process with an increase of about $50 million for its inspection needs. This is better than nothing but nowhere near what it needs to carry out its food safety mandates. The FDA currently inspects less than 2 percent of imported food shipments and 5 percent of domestic production facilities. The overwhelming nature of the task requires FDA to set priorities. Small producers think these priorities are misplaced. Is the FDA going after them because they are easier targets than industrial producers whose products have been responsible for some of the more deadly outbreaks? Time will tell. On the bright side, the food movement will gather even more momentum. While the food industry digs in to fight public health regulations, the food movement will continue to attract support from those willing to promote a healthier and more sustainable food system. Watch for more young people going into farming (see Chronicle staff writer Amanda Gold’s Dec. 25 article) and more farmers’ markets, farm-to-school programs, school meal initiatives, and grassroots community efforts to implement food programs and legislate local reforms. There is plenty of hope for the future in local efforts to improve school meals, reduce childhood obesity, and make healthier food more available and affordable for all. And on a personal note: In April, University of California Press will publish my co-authored book, “Why Calories Count: From Science to Politics.” I’m hoping it will inspire more thinking and action on how we can change our food system to one that is better for people and the planet. Lobbyists are supposed to report what they do and how much money they spend doing it, but this information is not easily available to the public. CBS News reports that PepsiCo spent $750,000 to lobby government last quarter. This comes to roughly $3 million annually, a drop in PepsiCo’s annual $30.6 billion sales in the U.S.—$57.8 billion worldwide. What is Pepsi lobbying about? Open Secrets publishes the filing information on its website. I’m especially interested in lobbying against the IWG guidelines. Pepsi, of course, was not alone in opposing them. As I noted in a previous post, the the Sunlight Foundation reported on food companies lobbying against them. …some U.S. policymakers have sought limitations on food and beverage marketing in media popular with children and teens. In April 2011, the Interagency Working Group on Food Marketed to Children (the “IWG”)…requested comment on proposed nutritional restrictions for food and beverage marketing directed to children and teens aged 17 years and under. Although the guidelines are nominally voluntary, if implemented by food and beverage marketers, they could have a negative impact on our Media Networks advertising revenues, particularly for our networks with programming targeted to children and teens. Congress asked the FTC to set up the Interagency Working Group to propose guidelines on marketing foods to kids. Did it really think food companies would accept such guidelines, voluntarily at that? As I keep pointing out, food companies have to market to kids to sell products and grow sales every quarter. If they don’t sell products to kids in the U.S., they will intensify efforts to sell products to kids in developing countries, thereby outsourcing childhood obesity. Surely it’s time for mandatory rules about marketing junk foods to kids? If not now, how about soon? The Environmental Working Group (EWG) is getting interested in childhood obesity. It released a report on sugars in kids’ breakfast cereals. The report shows—no surprise—that kids’ cereals are really cookies in disguise, typically 40% -50% sugars by weight. Kellogg’s Honey Smacks topped the list at 55%. I’ve been reading reports like this since the 1970s when Center for Science in the Public Interest published them at regular intervals. Not much has changed. Courtesy of Kellogg, I have a collection of copies of Froot Loop boxes dating back to the year in which this cereal was first introduced. I thought it would be interesting to check the sugar content. In 2005, Kellogg tried a version with 1/3 the sugar—10 grams—but it didn’t sell and quickly disappeared. Companies are trying to reduce the sugars by a little, but this seems to be the best they can do. It’s not enough. Cereals with a short ingredient list (of additives other than vitamins and minerals). Cereals with little or no added sugars (added sugars are ingredients such as honey, molasses, fruit juice concentrate, brown sugar, corn sweetener, sucrose, lactose, glucose, high-fructose corn syrup and malt syrup). Even better, try fresh fruit and homemade oatmeal. “Better-for-you” products better for food industry? Only if they can be marketed as such. A study released yesterday reports that so-called “better-for-you” (BFY) foods (those low in salt and sugar, high in fiber or with added vitamins, for example) may account for only about 40% of company sales, but they account for more than 70% of growth in sales. Placing more emphasis on selling BFY foods and beverages is an effective pathway to improved sales, profits, shareholder returns, and reputation. Proof that bottom lines can benefit when companies have a greater percentage of sales from BFY foods could accelerate progress toward the development and marketing of more nutritious foods. Public health officials and policymakers need to be aware of food and beverage companies’ core business goals in order to work effectively with them to address the obesity epidemic. I emphasize the third one because it sounds so much like a veiled threat. Or else what? Just watch what the food industry will do (and is doing) whenever public health officials try to restrict advertising to children or demand that that companies put nutritional “negatives” on front-of-package labels. Here’s CNN Health’s account (I’m quoted) and the one in the Wall Street Journal (I’m not).